Loving the new Dish magazine and this recipe is first off the rank. I found some king sweeties at our local community market today (also available at the local vege shop) so recommend grabbing them but you can substitute with red bell peppers. Heat olive oil in a saucepan over a low-medium heat & cook onion, garlic, paprika & a pinch of salt until the onion is tender. Stir in the pasta sauce & set aside. Combine the couscous & water in a small bowl, cover & leave for 10 minutes. Trim the tops off the peppers & remove the seeds, keeping the peppers whole. Place them in a heatproof dish & pour over enough boiling water to cover. Leave for 5 minutes then lift out & drain well. Heat oil in a frypan & cook onion, garlic & paprika until onion is tender. Stir in chorizo & cook for a further minute. Tip into a large bowl & cool. Add the couscous & mince, season & mix well. To assemble: holding each pepper upright, drop in small pieces of the stuffing using the handle of a wooden spoon to gently push it right to the bottom. 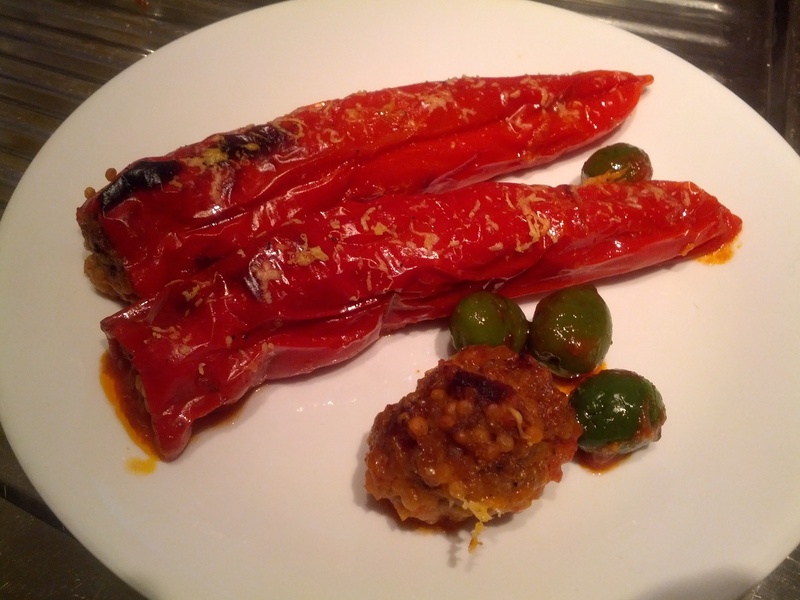 Continue until full to the top and repeat with remaining peppers. Roll any unused filling into balls. 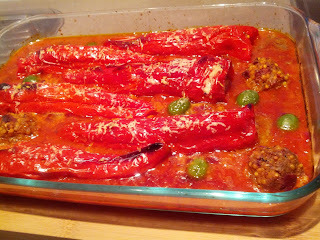 Tip the tomato sauce into a large shallow baking dish & place peppers on top, placing mince balls around them. 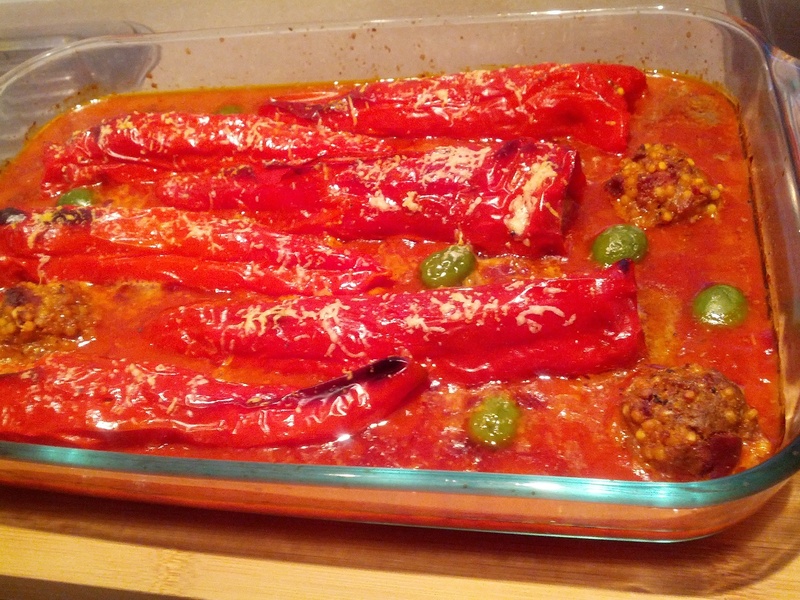 Place green olives around balls & peppers. Ground over some black pepper. Cover tightly with foil and bake 40 minutes. Uncover, scatter with fresh parmesan cheese and bake for a further 10 minutes until golden and the peppers are tender when pierced with a skewer. Serve with a green salad if you wish & enjoy!